Formed in 2007, the Cambini-Paris Quartet, one of the rare string quartets to play on period instruments, has quickly come to the fore on the musical landscape through the richness of its repertoire. The ensemble has been singled out and applauded for performing masterpieces by Haydn, Mozart, Beethoven or Mendelssohn and for its rediscovering forgotten French composers such as Jadin, David or Gouvy. In order to realise as closely as possible the musical conditions which the composers knew in their day, the Cambini-Paris Quartet plays on instruments strung with gut and uses bows appropriate to each epoch. By choosing the name of Giuseppe Maria Cambini (1746-1825), a violinist and prolific composer who led a life of adventure, the quartet bears witness to its interest in exploring the stylistic variety of the classical and romantic periods. The Cambini-Paris Quartet has performed in the most renowned venues and festivals: the Frick Collection in New-York, the Philips Collection in Washington DC, the Salle Bourgie in the Fine-Arts Museum of Montreal, the Palazzetto Bru Zane in Venice, the Marble Palace of Saint Petersburg, the Opéra Comique, the Auditorium of the Louvre Museum and of the Orsay Museum in Paris, the Versailles Baroque Music Center (CMBV), the Caen Theater, the Arsenal in Metz, the Concertgebouw in Bruges, the Amuz Music Centre in Antwerp, the Bijloke in Gent, the French Institutes in Vienna and Budapest, festivals at Deauville, Sable-sur-Sarthe, Épau, Newbury and saintes. The recordings of the Cambini-Paris Quartet have been critically acclaimed : 4 stars of Classica, “ffff” Telerama magazine Prize, Diapason « discovery », « disc of the month » of Classic Voice and the “Coup de Coeur” of Carrefour de Lodéon and Concertclassic as well. Amongst those : the Mozart six quartets dedicated to Haydn (Ambroisie-Naïve in 2015), Théodore Gouvy, book-disc (Palazzetto Bru Zane in 2014), Félicien David (Ambroisie-Naïve in 2012), Hyacinthe Jadin (Timpani in 2010) and 200 years of music in Versailles (MBF in 2007). Their latest recording, with the complete string quartets of Charles Gounod, has been released in april 2018 (Aparté). Great artists such as Nicolas Baldeyrou, Kristian Bezuidenhout, Christophe Coin, Jean-François Heisser, David Lively, Jérôme Pernoo and Alain Planès, have performed with them on equal terms. Since June 2016, the Cambini-Paris Quartet has been performing on four historic instruments, lended as part of the project « Adopt a Musician », an initiative of MusicMasterpieces at Lugano : a violin Francesco Pressenda of 1841, a violin Giuseppe Rocca of 1839, a viola Giuseppe Rocca of 1855 and a cello Antonio Guadagnini of 1881. 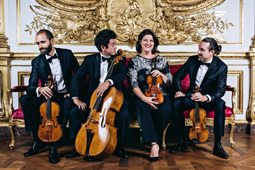 The Cambini-Paris Quartet is supported by the Ministry of Culture and Communication, la Caisse des Dépôts (principal sponsor) and by the Caisse d’Épargne Île-de-France. It and has residency at the Singer-Polignac Foundation in Paris. It has also an ongoing collaboration with the Center of French Romantic Music (the Palazzetto BruZane) in Venice. Please destroy all previously dated material. N.B. NO CHANGES ALLOWED without our permission.